After the teacher has introduced the formation of the Earth with the first series of the impressionistic geography charts, the students must be exposed to a broad and general view of the geological eras of our planet. For this introductory study, Dr. Montessori designed a circle graph that correlated the passage of millions of years to a 12-hour clock. The Clock of the Eras brings us from the Azoic Era, or formative time, to the present in a matter of “hours” and, at a glance, the child can recognize by color-coding the Proterozoic, the Paleozoic, the Mesozoic, the Cenozoic and Neozoic Eras, both on the circle graph and in time-line or linear formation. The same color-coding is then used in the great work of the Time Line of the Development of Life, where the Eras are subdivided into geological periods and epochs, marked by dramatic illustrations of all forms of life that show the ever increasing variety and complexity of evolution. The Time Line of the Development of Life consist of a Control Mural 2’ x 12’ laminated chart depicting in full color, the most important prehistoric plants and animals in each of the geological periods of the Earth’s history; the Mute Chart is of the same size and laminated. This chart has no pictures. It is used by the students as a working guide where the single cut-out pictures and labels printed on plastic-coated washable paper may be positioned to reconstruct the original chart; the Individual Pictures are to be cut out from four separate charts and organized in boxes according to the geological time to which they belong. 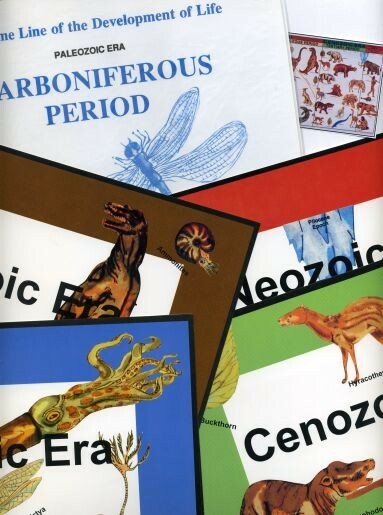 The 12 Story Cards, one for each of the geological periods, contain abundant information for the teacher to offer group lessons and for the students to consult for continuous reference. At the end of each research story there is a multiple-choice test designed to sharpen the student’s knowledge of the subject and increase his vocabulary and comprehension. A Glossary Booklet is also included. It contains the alphabetical listing of all scientific and uncommon words used in the research stories to the Time Line.